Home » Interviews » [Interview] Ace of Spades developer bcoolguy! [Interview] Ace of Spades developer bcoolguy! It seems I have both assumed the role of Lo-Ping’s go-to guy for indie interviews and “finder of games that can be described as ‘like Minecraft, but’ “. Not too shabby, all things considered. This week bcoolface took a break from his busy schedule to answer a few questions about his current project: Ace of Spades. For those of you that are unaware of this awesome game up until now allow me to attempt to sum this game up for you. 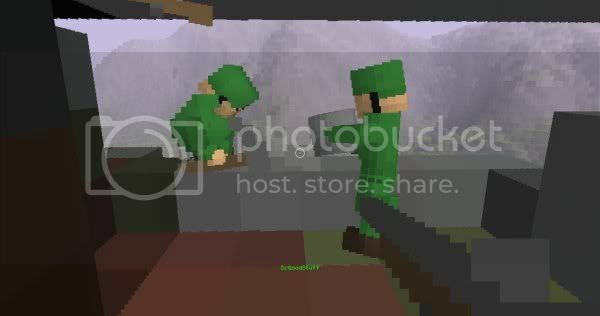 Take Minecraft’s look and digging abilites, hand the player character a M1 Garand and some digging tools, make it so physics effect everything (eg. digging a giant hole under an enemy bunker will cause it to collapse from lack of support, arches fall down in the keystone is destroyed, bridges are now fragile creatures) and put it all to the tune of a “capture the intelligence” online multiplayer mode… and you come pretty close. Or you could just watch this fan-made trailer. Now that we’re all sufficiently hyped, on with the interview! What inspired you to start developing AoS? I wanted to combine my favorite elements from first-person shooters and sandbox style games to create a shooter where creativity takes priority over reflexes. Will there be a visual upgrade before launch? I’m working right now on increasing the resolution of the weapon models and I want to implement better lighting in the future but the game will always have a kind of an oldschool 8-bit feel to it. Any plans for new or secondary weapons? I’d like to introduce an automatic weapon for close quarters battles, and maybe a satchel charge for destroying structures or as part of a new demolition gamemode type. Will there be a single-player element to the game in the future? I’d like to add a boot camp type training scenario and I’m going over a couple single-player ideas in my head. I think zombies have been overdone so I’m leaning towards a more realistic wilderness survival/hunting game that could be played co-op with friends. What is the experience of developing a purely online indie game like? Any new feature takes at least twice the work and three times the testing as a single-player feature so it has definitely been a learning experience. But the coolest part is joining a game with the fans and getting compliments for my work (before they blow my head off). Have you had any moments of fans giving suggestion or just doing something that impressed you so far or have you kept yourself away from the community on purpose? I do read my forums and I’ve worked in several community ideas already. I think the idea of a vehicle (land? sea!? AIR??) has been kept under wraps because it would require a lot of code and testing, but I think it’d be cool in the end. For some reason some people are almost ashamed to admit they play or even like video games in real life. If an attractive stranger asked you what you do would you proudly respond “game dev” or would you say ‘I tinker with software from time to time”? I think independent game development has a bit of a cool factor now especially when a lot of indie titles have sold millions. So yeah, “game dev” is definitely on my resume IN BOLD. I wanna thank bcoolguy for taking the time to answer our questions and I cannot wait to see how AoS develops in the future, especially with the little “maybe” response about whether vehicles could be an option. If Minecraft modders have told us anything, it’s that the ability to build vehicles in these games is fun as frak.